The giant 70mm screen of the Chelsea, Flinders Street in 1962, Melbourne’s second 70mm venue. Not so long ago a movie would appear with the tag ‘Presented in 70mm and six-track stereophonic sound.’ Such descriptors have all but disappeared from newspapers, radio and television. 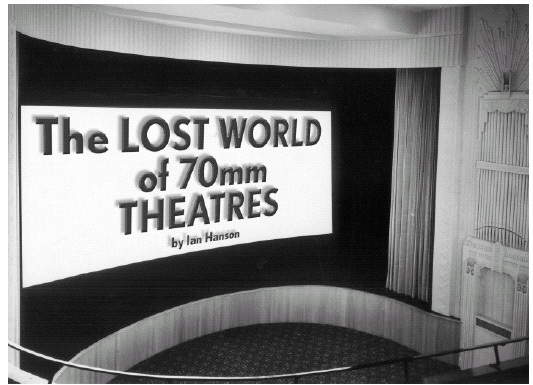 This story is about the rise and fall of 70mm film presentations and some of the theatres that used to screen them regularly; a review from a personal perspective, aided by some input from other keen followers of the subject. 70mm theatres were not only in the big cities, but also in regional centres such as Lithgow (New South Wales) and Shepparton (Victoria). At Yallourn (Vic.) the State Electricity Commission owned the theatre. The demise of this process came from two directions: the high costs of prints and technological changes in the motion picture industry. The introduction of DTS sound (reproduced by compact disc) and Dolby Digital and Sony SDDS systems (optical sound in both six and eight channels) made obsolete the four and six-track magnetic sound systems. In addition, the smaller screens of many cinema complexes have diminished impact compared with some of the veteran theatres. However, thanks to a dedicated group of exhibitors and technical support people both here and in the U.S.A. it is still possible to marvel at this technology. The company that did most to develop, market and ultimately perfect 70mm movies was the 20th Century Fox Film Corporation in conjunction with the Magna Theatre Corporation. In a sense Fox was completing what their antecedent company had attempted years earlier, long before stereo sound became available. William Fox, head of the Fox Film Corporation in the 1920’s pursued, amongst others, the development of wide film technology, but it was not until the early 1950s that a standard for 70mm was adopted. However, the Fox group could not claim all the credit for the invention. The enterprising Mike Todd (in association with the American Optical Company) went on to develop 70mm film and branded it as Todd-AO 70mm. The advantages of this system were, for their time, awe-inspiring. Any theatre that advertised a 70mm feature would, invariably reap box office rewards. 70mm features garnered Academy Awards out of all proportion to their numbers. MGM’s "Ben Hur" won 11 Academy Awards, which has been matched, but never surpassed, by Fox’s "Titanic" (1997) and "Lord of the Rings - Fellowship of the Ring" (2003). 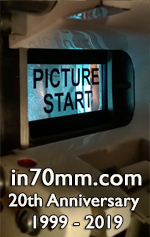 A comment to "The lost world of 70mm Theatres"
70mm film, as the name implies, is the actual width of the film (although the camera negatives were usually 65mm width) and twice the width of conventional 35mm film. Sound engineers then devised a system whereby six channels of stereo sound could be added by striping the prints with magnetic sound tracks, similar to that used on the old reel-to-reel tape recorders. 70mm was visually and aurally superior to other wide screen processes because it provided the largest sized image in the projector gate and needed less magnification. This meant that the picture on the screen was brighter, sharper and less grainy. The six-track stereophonic sound offered a superior frequency response and less hiss. In the case of standard 35mm film, each frame of film has four perforations and travels through the projector at 24 frames per second, which is 27 metres (90ft) per minute. 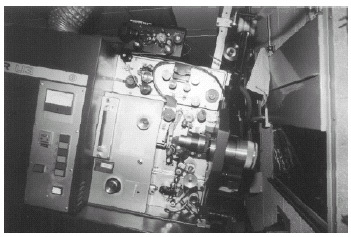 70mm film contains five perforations per frame and running at the same speed of 24 frames per second, 34 metres (112.5) feet of film passes through the projector per minute. The first 70mm feature film was Rodgers and Hammerstein’s "Oklahoma! ", which opened at the New York Rivoli in October 1955. The second feature, Mike Todd’s "Around The World in 80 Days" was released the following year. Both films utilised the initial, shortlived 70mm standard of projecting the image at 30 frames per second to reduce flicker. The uptake of 70mm installations was painfully slow and fell below expectations. By 1957 there were about 60 installations of 70mm worldwide. Both "Oklahoma!" and "Around the World" were released in Australia on 35mm with four-track stereo sound. Only "Oklahoma! ", which premiered at Hoyts Regent Sydney in May 1957, was technically in CinemaScope. This was not a reduction print, but was filmed separately, shot for shot. "Around the World", which opened at Hoyts Paris Sydney on Thursday 3 December 1957, was filmed [actually projected, ed] in Cinestage, another Todd process that used 35mm film but with a lesser anamorphic ‘squeeze’, which gave a brighter, sharper image than CinemaScope. The advertising for the film was coy about the wide screen process used and most Australian audiences believed that they were seeing a production in Todd-AO. "Around The World" was an enormous hit, running 112 weeks, breaking all records. 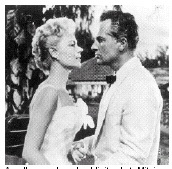 A well-remembered publicity shot: Mitzi Gaynor and Rossano Brazzi from "South Pacific". Twentieth Century Fox Film Corporation purchased an interest in Todd-AO and Mike Todd departed around 1957. (Todd went on to devise yet another 70mm process called Todd-70 [actually it was Mike Todd, Jr. for "Scent of Mystery", ed].) In co-operation with Magna Theatre Corporation, Fox produced the third 70mm feature, the Rodgers and Hammerstein musical "South Pacific". This film became the first feature shown in 70mm in Australia after the Fox-controlled Hoyts Theatres Ltd. decided to install 70mm equipment. The original plans called for only two installations. The first was Hoyts Mayfair Sydney and the second was Hoyts Esquire Melbourne. Hoyts were meticulous about standards for such installations, which were costly. Long-run roadshow engagements of 70mm films required 1,000 to 1,500 seat theatres. The Mayfair met this criterion with its capacity of 1,249. The conversion required complete closure for several weeks to fit a new screen and proscenium. Upgraded sound, from four-track to six-track, required additional speakers. The projection room was completely refurbished. Thinking big: Three films were made by Fox in 70mm Grandeur, but Oscar Strauss had nothing to do with them. The Depression doomed the venture. No theatres in Australasia were equipped for the process. The new projectors were Philips ‘Norelco’ or EL 4000 dual gauge 35/70mm models, made by the Philips company of Eindhoven, Holland. In Australia this model was known as the Philips EL 4000, which is the actual part number for the projector. In Europe it was known as the DP70. In North America the projector was marketed as the AAII by Norelco, (the brand name used by Philips in North America). Philips replaced this model in 1966 with the DP75, a radically different machine. Many examples of both models are still operation in Australia. The high powered arc lamps required to illuminate the large screen were manufactured by Ashcraft in the U.S.A. Water pumps were installed to cool both the gates in the projector and the lamphouse. The Ashcraft Super Cinex lamphouse consumed an enormous amount of electricity, 160 amps of current to be precise! These were the most powerful arc-lamps in common use and ran very well. The Mayfair conversion included enlarging the theatre’s small foyer by intruding into the back stalls and building a false wall. A box office for advanced ticket sales was also added in this area. The seating capacity was reduced to 970 patrons. The exterior was repainted and murals of palm trees adorned the Castlereagh street facade. "South Pacific" opened on 26 December 1958 and went on to break all records. One claim in the early 1960’s was that the Mayfair held a world record for a film in one theatre - three years. In Melbourne the conversion at the Esquire was not completed until 1959. Seating there was reduced from 1,526 to 1,125. The Esquire received the same projection equipment as the Mayfair.
" South Pacific" exceeded all expectations as a box office performer. From 1962 onwards, Fox released 35mm versions for the initial releases in Hoyts suburban theatres and elsewhere. A general release version was slightly shorter than the 70mm ‘hard-ticket’ version; no hacking out, just a little trimming here and there of the longer set-pieces. With the success of " South Pacific", Fox announced that henceforth, their biggest productions would be in Todd-AO; a decision they held to through the sixties. Most of the Hollywood studios now climbed on the bandwagon, which increased the demand for more specialised theatres. In 1959 Hoyts decided to convert a second Sydney theatre to long-run 70mm films. This was the Paris, Liverpool Street, a cinema with a rather chequered history. Hoyts had leased it during the 1920s as Hoyts Australia Picture Palace. After several name and management changes Hoyts leased it again in 1951 and renamed it the Park. By 1955, it was Hoyts Paris, the new home of continental films, a policy that lapsed after 18 months. Following the long run of "Around The World", which ended on 25 November 1959 at the Paris, work started on the conversion to 70mm films. This was not as elaborate as that carried out at the Mayfair although it did include identical projection equipment. United Artist’s "Solomon And Sheba" was the first 70mm release at the Paris (10 December 1959.) Unlike " South Pacific", expectations for a long run failed to materialize, and it was replaced with Fox’s "Can Can" after a few months. This extravaganza, with music by Cole Porter, had a run of 18 months. However, the Paris was a long, narrow cinema seating about 800, with a small and rather cramped screen, compared to the Mayfair. The ever observant public were less than impressed. After adopting a wait-and-see attitude, the Greater Union Organisation began some theatre conversions to the new medium. In 1960, G.U. announced that work would start in Sydney on the Lyric, George Street. In Melbourne G.U’s 70mm outlet would be the Majestic in Flinders Street, soon to be re-named the Chelsea. The Lyric and the Majestic were two of the oldest cinemas in operation in their respective cities. The conversion of the Lyric was dramatic. It had a number of awkward features including a three-tier auditorium. G.U. decided to trim the seating from 1,358 down to 800. They did so by eliminating the Upper Circle and placing a false ceiling from this point to the stage. The theatre was re-seated, redecorated and re-named the Cinema Forum, in the knowledge that the décor would fit nicely with a forthcoming blockbuster. The opening attraction in June 1960 was Sam Goldwyn’s adaptation of the George Gershwin musical "Porgy and Bess". Next came the really big one, Universal's 70mm epic "Spartacus". The head of G.U., (the late Sir Norman Rydge) then managed another coup. His film distribution company, British Empire Films secured the output from the Samuel Bronston Studios. Bronston saw himself as the new Cecil B. DeMille, with films to match - "El Cid", "55 Days At Peking", "Circus World" and "Fall Of The Roman Empire". All were 70mm and all were shown at the Forum and the Chelsea. 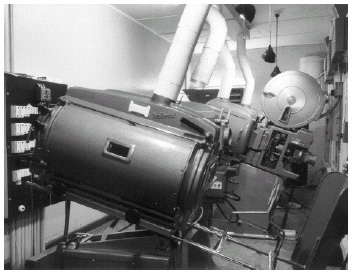 Projection room at the Chelsea, Melbourne in 1962. First is the slide machine, with two Cinemeccanica projectors in the background. (Photo: Bob March). What was MGM doing at this time? After plugging away with various 35mm systems the studio changed direction and commissioned the Panavision lens company to devise a system that would provide the best possible release prints in any of the processes currently in use. Panavision came up with a system that used 65 mm film (as did Todd-AO), with a slight horizontal squeeze. From the big negative, clear, sharp prints in any format from Cinerama to Super 8 could be produced. The process was called Camera 65. MGM’s first film in this process "Raintree County" played no 70mm engagements whatsoever, possibly because all 70mm equipped houses were occupied with the first three Todd–AO productions. MGM’s second excursion into Camera 65 was the super blockbuster "Ben Hur". It did 70mm engagements in the conventional unsqueezed 70mm format, completely compatible with Todd-AO. Ironically it sometimes looked better in full width Cinemascope (2.55:1) than in 70mm. If you have seen it at the Astor, the side of the image is cut off in a few scenes, as for example when the beggar rejects "Ben Hur"’s leprous coin. Cinemeccanica (Victoria 10 model) at Hoyts Plaza, Sydney (now closed.) Photo by the author. At this time MGM was considering whether to convert the Metro Bourke Street to 70mm, but decided against it because of the steep projection rake and a small projection room. They did however install four track magnetic sound. No other films carried a Camera 65 credit. Panavision re-named their process Ultra Panavision which was used for "Mutiny On the Bounty" (the Marlon Brando version) and many of the ‘single lens’ Cinerama productions. By 1962 theatres equipped to show 70mm had reached all Australian capitals, and theatres in large regional centres such as Newcastle and Wollongong in N.S.W. had either opened or were being altered for it. As the demand for 70mm increased so did the demand for equipment. 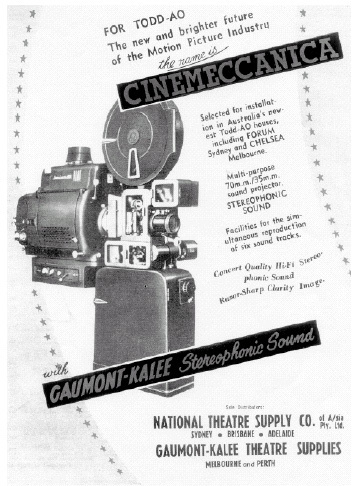 The Greater Union Organisation through its technical support company, National Theatre Supply imported the Italian designed Cinemeccanica R.K.60 35/70mm projector. These machines were highly successful and were adopted by G.U. as standard in 1960. Some of the original machines are giving sterling service in new surroundings such as Drive-In theatres and some independent theatres. In the early 1960’s the name R.K.60 (which means Rank Kalee) was dropped and the later models became Cinemeccanica Victoria 10 and Victoria 8 projectors. In 1970 the General Manager of National Theatre Supply (the late Ray Smith) stated that his company had completed 80 installations of 70mm. Hoyts Theatres announced in late 1963, that it would equip its second Melbourne 70mm theatre, specifically for the launch of Fox’s "Cleopatra". They chose the Lyceum Bourke Street, another oldie which had been showing films since 1915. The auditorium was disguised behind floor–to-ceiling gold curtains, lit by concealed pelmet lighting. Seating was improved and new red and gold carpet laid. Philips ‘Norelco’ 35/70mm equipment was installed along with a new 13m (43ft) “Harkness” screen. A gala charity premiere on Thursday 27 February 27 1964 heralded the re-opening as the "Cleopatra", the first identification of a cinema with its film, only warranted because a record-breaking season of some years was anticipated. It was wishful thinking; the season ended on 16 April 1965. Hoyts then re-named the theatre the Paris and brought in the highly successful "The Sound of Music". The Paris was perhaps the shortest-lived of any first run 70mm theatre. It closed on 28 January 1970 and was demolished as part of a major redevelopment which also brought down the Tivoli theatre. From the top: For a new life as an up-market showplace, the Esquire, Melbourne was given front doors and a verandah, missing since 1926. Melbourne’s Bourke Street was unique in that two of its cinemas came to be named after films. The second example was when Tyes furniture store was converted into two cinemas. One of them became the My Fair Lady Theatre in 1966. A specially built cinema in Adelaide was also named in a similar fashion. It was known as the Fair Lady Cinema and became the only one to retain its film name after the season of the film was over. Warner Bros.’ "My Fair Lady" brought forth the biggest print run of 70mm prints ever known. Theatres were purpose built for this film around the world from 1964. Initially the Sydney venue was to be the Ascot, a new 70mm theatre located in Pitt Street. 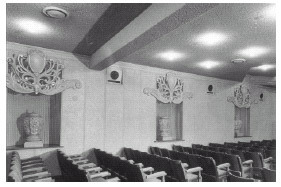 Warner Bros. had second thoughts and struck a deal with Hoyts who refurbished the Century in George Street and equipped it with Cinemeccanica Victoria 8 projectors. The Century held 865 patrons, but the screen size was less impressive than at the Ascot. G.U. also found 70mm films to be a bonanza and invested in further theatre upgrades. In 1963, the former Palladium theatre in Sydney’s Chinatown was transformed by the clever concept of erecting a new cinema inside the shell of an old one. The new house became the Barclay and it opened with "Guns of Navarone" (which was not in 70mm!). The first 70mm epic shown at the Barclay was "Lawrence of Arabia". The source of ‘Barclay’ was said to be Lady Rydge’s maiden name. For many years the Chelsea in Melbourne was GU’s only 70 mm house. G.U. built the Bercy from the ground up in the mid-1960s intending it to be a prestige house, which meant 70mm equipment, but for some reason penny-pinching economies crept in. The second-hand Kalee equipment did have four-track magnetic capacity however. "Funny Girl", which should have run in 70mm, did at least run with stereophonic sound. Similarly there is the strange case of "Oliver! ", which Melbourne audiences should also have seen in 70mm. Instead, the Odeon was slightly upgraded but not even to stereophonic sound, even though the print was magnetic. At least the Odeon used the magnetic tracks on the film, paralleling them into their mono sound system. This at least gave superior fidelity. The distributor of both these films, Columbia, was happy to bring 70mm and 35mm stereophonic prints into Australia. It is a pity that G.U. never fully capitalized on them. In any event, Columbia shortly after took its first run business to Hoyts who promptly ran a 70mm revival of "Oliver!". G.U. would however show a new commitment to 70mm in the multiplex era. Cinema 1 at Hoyts Cinema Centre, Melbourne. The generous curve of the curtains concealed an equally impressive 21m (70 ft) Harkness screen. The Cinema 2 fit-out was similar. In Adelaide G.U. converted Wests in Hindley Street with minor changes compared with some other locations. In Brisbane in 1965, G.U. opened their first 70mm theatre known as the Cinema George with "Fall of the Roman Empire". An interesting concept (first introduced at Sydney’s Barclay) was the decision to fuse picture-palace style items such as Roman statues, with modern lay-out and decoration. The screening of 70mm films was not confined to specially designed theatres. Well to the fore in the 1960’s were Drive -In theatres where large screens created an ideal environment for such presentations. The down-side was sound reproduction, as all of that stereo sound was chanelled into a solitary speaker hanging off the inside of the car! The grand old bastions of cinema, the Regent, Melbourne and the State, Sydney were also fitted with 70mm equipment. 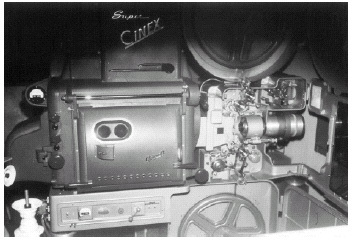 The Regent received 70mm Cinemeccanica equipment in the 1960’s. One 70mm release there was "Chitty, Chitty, Bang, Bang". Identical equipment was re-instated after the restoration of the theatre by Marriner Theatres. Sydney’s palatial State theatre was fitted out in 1980, but the narrow stage surrounds allowed only a small screen, so the only advantage was the sharper image. The first 70mm film shown there was "Divine Madness" with Bette Middler. By 1967, 70mm was well established in all Australian cities as well in selected suburban sites and numerous Drive-Ins. Amongst the early independent installations was the Dendy at Brighton, near Melbourne. 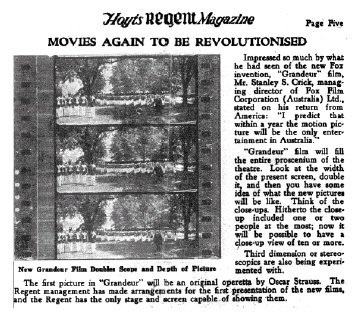 The Dendy’s reputation as a quality cinema, was enhanced by the result on the large screen. The Rivoli Camberwell, another quality cinema, also got 70mm around this time; state-of-the-art Philips equipment. 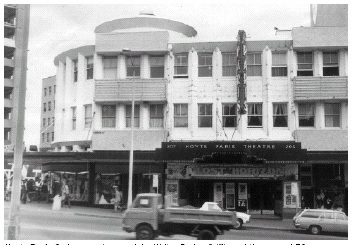 In Adelaide, Hoyts installed 70mm at their refurbished Regent in 1967 and also in the new Paris. The latter screened a 70mm single lens Cinerama version of "Ice Station Zebra". 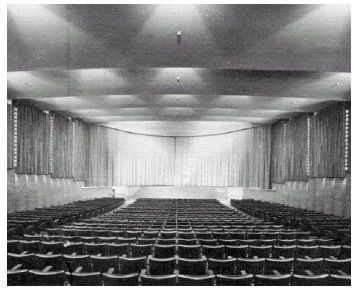 The season commenced on the 28th August 1969 and was the only occasion that a Cinerama film screened in Adelaide. The development of cinema complexes in the 1970’s went hand-inhand with the roll out of 70mm. One of the earliest, and an outstanding example was in Hoyts Cinema Centre Bourke Street, Melbourne. My favourite screen was Cinema One’s giant curve, specially designed for single lens Cinerama. Cinemas One and Two had 90 degree screens made of vertical ribbons, just as in the Cinerama installation in the Plaza Melbourne. They were removed in the 1980s. In Melbourne, G.U. opened their Russell Cinemas in 1978 with six screens. Two were fitted for 70mm. The first 70mm film there was the "Sgt. Peppers Lonely Hearts Club Band" (the Bee Gee’s version). The film was a disaster both in Sydney and Melbourne, but in 1980, "Raiders of the Lost Ark" redeemed things a bit for 70mm at the Russell Cinemas, with a run of over 12 months. When it came to manufacturers of reliable, first-rate equipment with dual sprockets, the market place was dominated by two names, Philips and Cinemeccanica, but other manufactures were not far behind. In 1963, the Century Projector Company of the U.S.A. unveiled their 35/70mm JJ3 model machine; but very few of them came to Australia. Two that did were acquired by Mike Walsh for his Hayden Orpheum at Cremorne. They are still there, and sometimes still screening 70mm films! 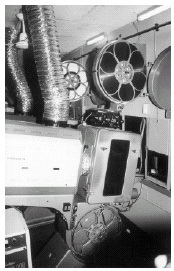 About 1970, Village Theatres purchased a number of Toshiba projectors for screening 35/70mm film. A plant was installed in their then new Brisbane Village Twin at New Farm and at other locations in Victoria. About 1972, Village announced that a state of the art projector was being imported from Germany. The new projectors were the Bauer U3 model. These machines were far less cumbersome than their earlier cousins. They could be converted for 70mm and many were. An innovation was that the machines came complete as one unit, and a separate make of lamp-house was not required. In addition, the light source was powered by a xenon lamp. A measure of their versatility was that the Bauer U3 was designed for the smaller, intimate theatre and a smaller screen, but I have seem them in use on large screens with quite good results. The Bauer U3 came with optional lamp-houses; a smaller and a larger version. The larger version was meant for 70mm presentations and could handle 4,000 watt xenon lamps. Village City Centre, Bourke Street was equipped with two 70mm houses when it opened in 1986: Cinema 1 and Cinema 3. Cinema 1 was Australia’s first 70mm THX certified theatre. Village were still installing Bauer U3's for 70mm screenings as late as 1988, when they unveiled their Cinema One at the now razed Cinema City complex in Sydney. Whilst Village Theatres were the biggest users of Bauer equipment, it did find its way into several other theatres. The number of 70mm feature films waned in the late 1980s. Their demise was due to the high cost of prints - which can be as much as $50,000 each - about ten times the cost of a 35mm print, and the introduction of digital sound in the early 1990s. Up to that time, only 70mm could supply very high quality sound. No 70mm feature films were made in Australia, all were processed in the United States or Great Britain. "Mad Max III Beyond Thunderdome" was blown up to 70mm and shown that way at the Capitol Melbourne. This, and an IMAX short have been Australia’s only 70mm films. Improvements in picture quality of 35mm film over recent years plus the introduction of digital sound has rendered 70mm all but obsolete. Exhibitors have come to realise though the benefit of larger cinema screens. Patrons do not like paying top dollar for a screen not much larger than a bigscreen television set, and multiplex construction from the mid -1990s overcame the problem of mean screens. The spectacular world of 70mm contained a few lemons, ("Sgt. Pepper’s…" as mentioned), one or two obscure titles and some cinemas not readily recalled as 70mm venues. A colleague of mine showed me a program for a film called Bing Crosby’s "Cinerama Russian Adventure". He remarked that he did not recall seeing it anywhere. This film was made in 1966. I found an obscure block advertisement for a screening of " Cinerama Russian Adventure" at Sydney’s Forum in 1980 and in 70mm! It barely lasted a week. It also passed through the Chelsea Melbourne, again for a week; possibly the shortest runs of any 70mm feature anywhere! Also in Melbourne the Forum Cinema received second hand 70mm Cinemeccanica machines from the Chelsea next door in order to show "That’s Entertainment" in 1974. I recall a festival of long-lost films, all in 70mm. The program was all the 70mm titles available from Warners, Universal, M.G.M. and Paramount - the last time some titles were shown in the 70mm format in Australia - and only screened in Melbourne in 1980. The last new 70mm feature dates from the mid 1990s; the Kenneth Branagh version of "Hamlet", which would have to rank as the longest 70mm film in history! Despite the paucity of genuine 70mm, there has been one development. Fox’s "Titanic" (1997) was released in a 70mm format from a process called Super 35. Filmed without anamorphic lenses on 35 mm stock, the process allows a 70mm or Cinemascope-style projection print to be produced from the negative. For Titanic the old six-track stereo sound with its magnetic stripes was replaced by a single time-code for DTS. So, for the first time, a 70mm feature contained a soundtrack on a compact disc. A special reader installed on top of the projector picked up the signal to operate the C.D. soundtrack. Film has found a new home in the world of the IMAX and IWERKS theatres. This technology is awesome, with the IMAX Theatre Sydney now credited in the Guinness Book of Records with the world’s largest indoor cinema screen. Some interesting feature film experiments in this format include a remake of Walt Disney’s Fantasia. Until now the enormous cost of IMAX presentation has meant that it only survives in the largest population centres of Sydney and Melbourne. IWERKS (a cheaper form of Imax) has never progressed beyond the solitary Edge Cinema at Katoomba. One of the Federation Square Cinemas in Melbourne is equipped with 8/70 IWERKS projection equipment and it gets an occasional workout. Fox, the company that did most to place 70mm on a solid foundation, is now leading the way with the restoration of some of their back-list. New prints of "The Sound of Music", "Doctor Doolittle", "Hello, Dolly!" and "The Agony and the Ecstasy" have been screened at the Bradford wide screen festival (U.K.), and "South Pacific" is promised for 2006. Thanks to the dedication of a few cinema-owners in Australia, these titles and others have a chance of getting a screening as they were meant to be seen - in 70mm. I wish to thank David Kilderry, David Orme, David Coles and Eric White for their ongoing interest, advice and input. Widescreen Cinema by John Belton. The Film Weekly Directory 1958/59. The Performer, various issues (Hoyts Publication).